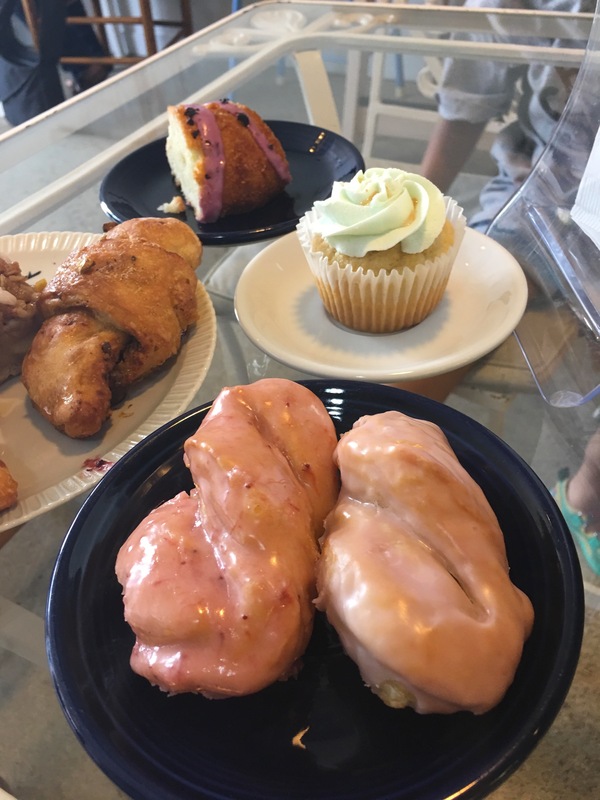 Happy Chicks Bakery – Go There. Try That. My sweet friend Ebony is introducing me to a whole new world. Veganism. Now, am I in any way, shape, or form a vegan? No. But, I’m always interested in good food. 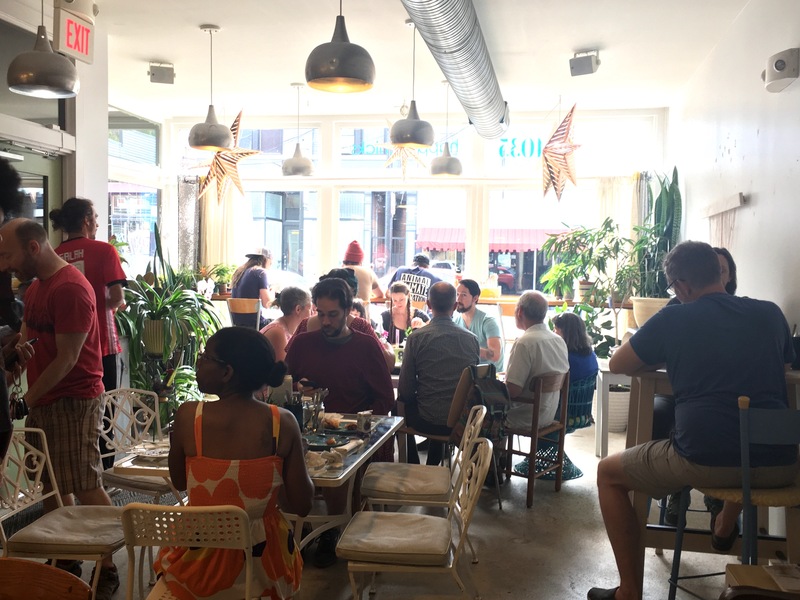 So thanks to Ebony, I’m learning about vegan eating in Cincinnati; expect a few more posts this summer highlighting more of those places. Today, I start with Happy Chicks Bakery in Northside. Ebony knows the way to my heart; she got me a gift card to Happy Chicks because I definitely love sweets. We were told to go early on a Saturday morning because Saturdays are donut days! Early is the key word here; people were already lining up outside before the doors opened (good sign)! We ordered one of each pastry and donut. Oh my stars that lavender lemonade donut is spectacular! 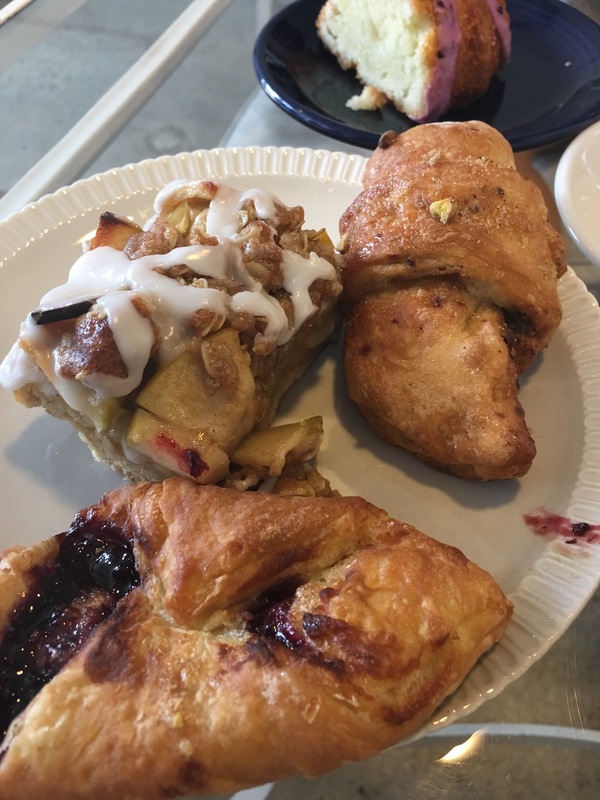 I’m not normally a baked fruit person (I know, weird), but this apple danish was incredible. My husband especially loved the baklava croissant. Front left corner= blueberry lavender teacake= rocked my world. 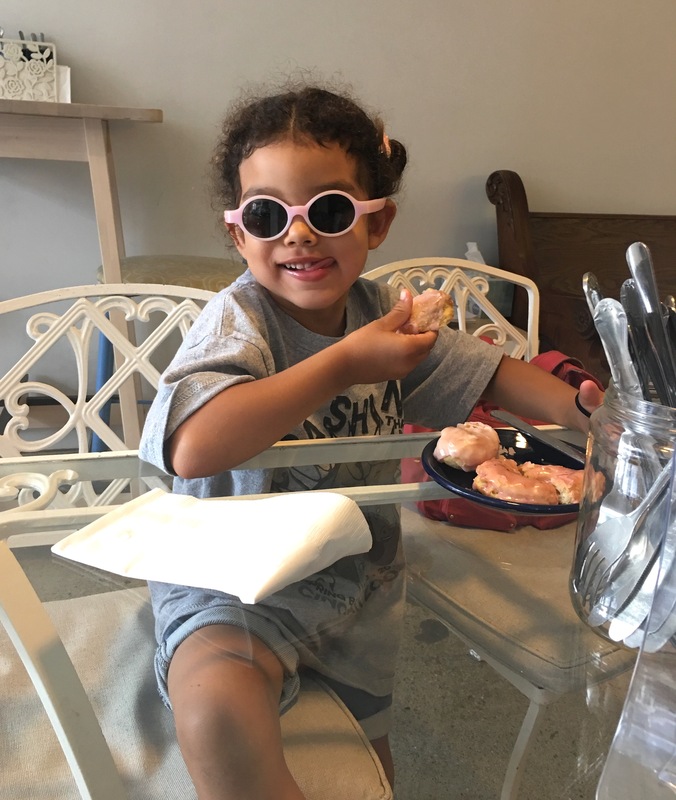 My friend Ruby is crushing those donuts in style! 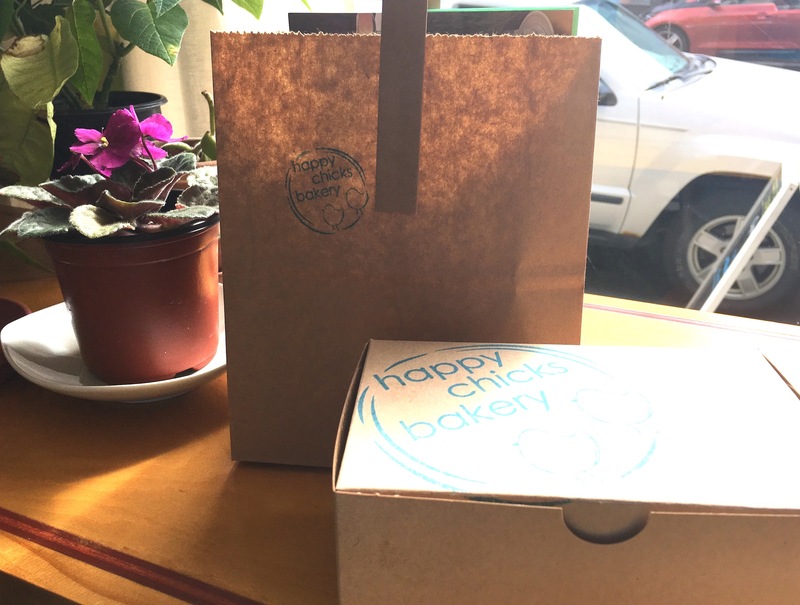 Happy Chicks is a local independent bakery (three of my favorite words right there). They do specialize in cakes (beautifully decorated, tons of interesting flavors), but offer up a strong pastry and lunch menu as well. Again, all vegan. Now this will shock my friends because I never get jazzed about a PB&J; however, I tried Ruby’s PB&J, made with blackberry jam and served on the homemade croissant, and was so impressed I ordered one to go. The croissants here are where it’s at. We’re talking buttery, flaky, slightly crispy, melt-in-your-mouth, never-made-these-at-home croissants. I also scored a bite (or two) of Ebony’s empanada and the Korean BBQ is excellent too! 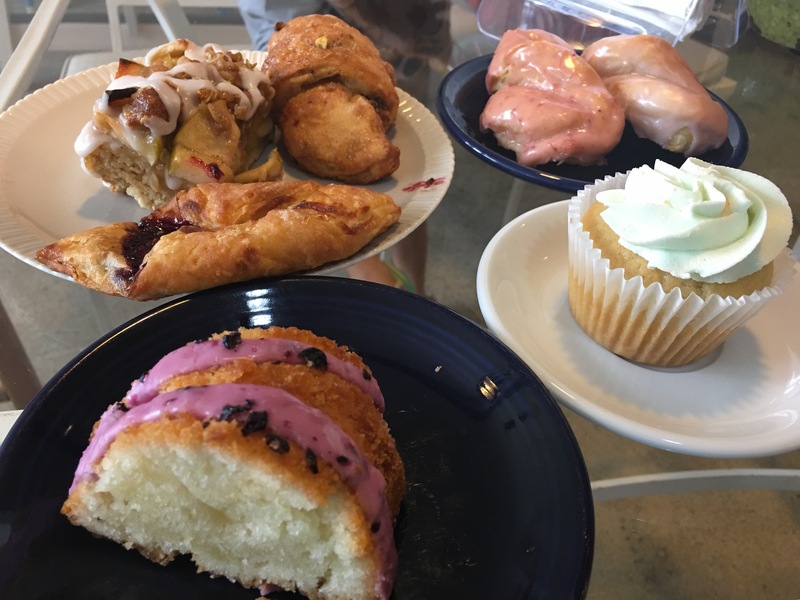 Basically, I love this vegan bakery! I keep talking about it to people and I’m eagerly anticipating my next visit. Saturday morning and the place was hopping! Light and bright, it’s a great atmosphere. When you basically order one of everything, you get to bring some home for later. Also, Happy Chicks keeps an array of cakes in shop so if you’re ever in a pinch, grab a cake at Happy Chicks . . . because . . . why would you grab a cake anywhere else? And Ebony, way to start this vegan tour with a bang! I love getting introduced to new places and new flavors. 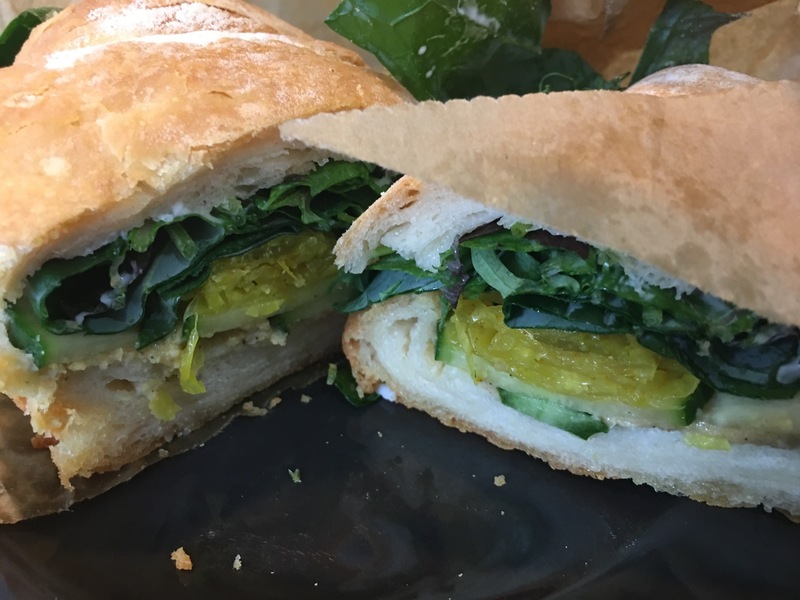 Anyone else have a favorite vegan restaurant? GO THERE (Happy Chicks)! TRY THAT (arrive Saturday at 8:50 am and order all the pastries, especially the donuts)! I’ve heard vegan croissants are really difficult to get right, so glad to hear that there’s are good! Interesting! I didn’t know that. Yes, these are delicious.